We are battling R.S.V. in my home this week…SIGH! Poor Maxwell is through the worst of it and his sweet baby sister is currently in the trenches. While she restlessly was sleeping upstairs I convinced Maxwell to help me make her some soup. I’m in love with this Delicious Ham and Potato Soup recipe that I adapted from allrecipes.com. As Maxwell and I were preparing this soup together we were able to have many delightful conversations, first we talked about how sissy was not feeling well. He asked, “What’s wrong with sissy?” I replied “She has a fever and is hurting like you were the other day, so we are making her some soup to help. What helped you fell better when you were hurting Maxwell?” He then looked right into my eyes, pointed his little finger at me and said “YOU Mommy!” Ohhhhhh hearing him say that with his shy smile on his face filled my heart with love and joy. I guess that is exactly what little ones need when they are sick, their Mama’s and homemade soup to go along side. The next conversation we had made us pause from cooking for a moment, we began talking about a little boy who is currently in the hospital and had surgery. The little boy suffered some complications the day before and I showed Maxwell his picture and asked him if he would like to pray for the little boy. He grinned and replied “Yes!” We collapsed our hands together and prayed. WOW who knew a cooking lesson with my son could turn into a moment I will cherish for the rest of my life. Through all the ciaos this week their were so many things to be grateful for. I’m going to choose to focus on those many wonderful memories and move forward from the moments of weakness and distress. 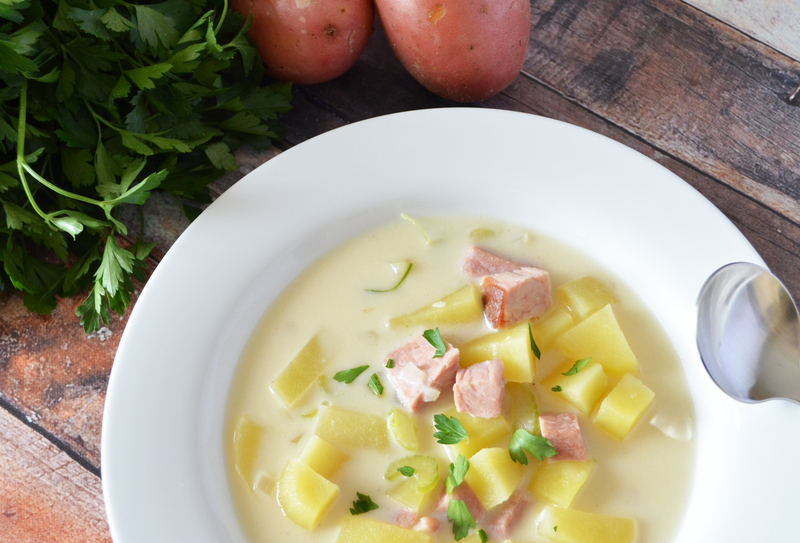 Last weekend, after enjoying our Easter ham, I made sure to chop and freeze extra ham anticipating making this Delicious Ham and Potato Soup. I love using my Simple Sweet and Savory Ham recipe, but you can use any glazed ham of your choosing. It has the perfect creamy and buttery based broth, paired with celery, onion, potatoes and of course the star ingredient, delicious chopped ham. How can I describe this Ham and Potato soup? It’s simple yet, unbelievably perfect and delicious all at once.